C P Treasures A wizard's ability to predict future events should be used sparingly, advises Merlin in The Book of the Secrets of Merlin: Wizardology. 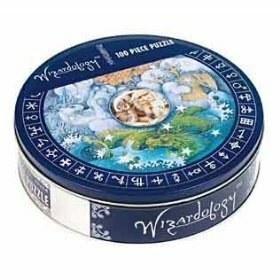 Yet mere mortals can predict that apprentice wizard will enjoy assembling this 100-piece Wizardology puzzle from Mudpuppy. It reproduces the cover of the book---unicorn, dragon, fantastic birds a wizard and his owl. The puzzle's pieces are stored in an round hinged storage tin. New in Tin For ages 5 Check my C P Treasures booth for more great puzzles!